Hillary Clinton directed her staff Tuesday to deliver her private email server to the Department of Justice as the FBI moves forward with its criminal probe into the security of the email system she used while secretary of state. The Associated Press reported that Clinton will hand over the server as well as thumb drives currently in possession of her attorney that contain roughly 30,000 work-related emails from her time in the Obama administration. The move comes just as intelligence community Inspector General I. Charles McCullough III determined that no less than two of the 40 emails held on Clinton’s private system that he was permitted to review contained "top secret" information. "She directed her team to give her email server that was used during her tenure as secretary to the Department of Justice, as well as a thumb drive containing copies of her emails already provided to the State Department," campaign spokesman Nick Merrill said Tuesday. "She pledged to cooperate with the government’s security inquiry, and if there are more questions, we will continue to address them." McCullough, who had previously concluded that four emails on Clinton’s private system contained "secret" information in addition to a fifth that was improperly released by the State Department, now says that seven emails–nearly one-fifth of the sample he was permitted to review–contained classified information at the time they were sent. Despite his requests, the government agency has not allowed McCullough access to the entire batch of emails. Clinton attorney David Kendall had previously refused to provide Clinton’s emails to the House Select Committee on Benghazi despite subpoena orders, insisting that her personal server has been wiped clean of all communications from the email address she used while at State. He had also claimed that "there is no basis to support the proposed third-party review of the server." Nevertheless, Kendall was forced to hand over the three thumb drives containing all of Clinton’s work-related emails after the FBI decided that he could not continue to possess emails containing classified information, according to an anonymous U.S. official. Republican National Committee chairman Reince Priebus slammed Clinton in the wake of reports concerning the server. "All this means is that Hillary Clinton, in the face of FBI scrutiny, has decided she has run out of options," Priebus declared in a statement Tuesday. "She knows she did something wrong and has run out of ways to cover it up." House Speaker John Boehner (R., Ohio), who just last month demanded Clinton hand over her email server "immediately," accused the former secretary of state of making "patently untrue" statements about her email system. "Her mishandling of classified information must be fully investigated," Boehner added. 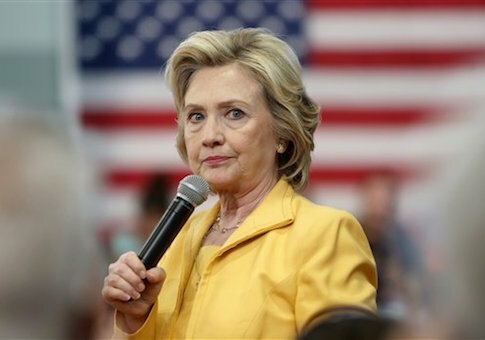 Throughout her presidential campaign, Clinton has denied sending or receiving classified information on her personal email system, telling reporters in July, "I am confident that I never sent or received any information that was classified at the time it was sent and received." Multiple lawmakers have claimed that Clinton’s use of the private email system could compromise national security. Reports surfaced this week that China has accessed private email accounts of top Obama administration officials since 2010, which overlaps with the time period during which Clinton served as secretary of state. This entry was posted in Politics and tagged 2016 Election, Cyber Security, Hillary Clinton. Bookmark the permalink.